As I’ve written about before, we at George Mason University just outside Washington, D.C., get our share of high-profile visitors, including presidents, vice presidents, U.S. Supreme Court justices, senators, candidates, and foreign heads of state. In late April, former Vice President Joe Biden visited us as part of the “It’s On Us” campaign about bringing awareness to and fighting sexual assault. After his very emotional speech, he took time to take photos with nearly everyone in the room. I was right outside the hallway where the green room was, guarding one of the exterior doors while other staff controlled the adjacent street and parking areas. Rather unexpectedly, one of his staff members asked if I wanted to take a photo with Mr. Biden. Of course I did! I was ushered into the green room. 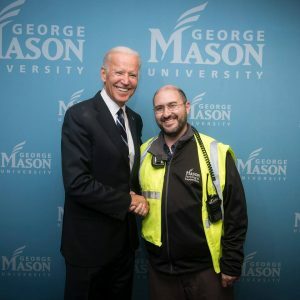 As I walked up to shake hands with the former V.P., he saw the Parking & Transportation jacket I had on and said, “Wow, you have the hardest job on campus … I bet nothing happens without you.” I was pretty impressed that he recognized the role of parking & transportation on campus and during events. A colleague of mine said it might be because of his knowledge of parking from parking tickets during law school at Syracuse. Either way, it was a nice moment as usually we parking folks, while often very close and very involved in the high-profile events, don’t get to meet the dignitary. Here’s a story about his visit. Without these campus operation managers our University Campuses parking would be even more of a night mare! Josh, that is absolutely awesome. I am very proud to consider myself a parking professional with exceptional colleagues in all sectors of the parking industry. Thanks for being such a great representative.